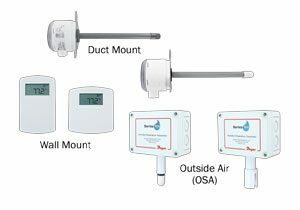 Humidity sensors are one of the most common types of sensors used for HVAC equipment and building management systems. 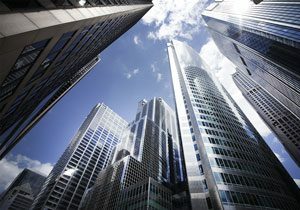 With proper humidity monitoring, energy efficiency of a building can be improved. 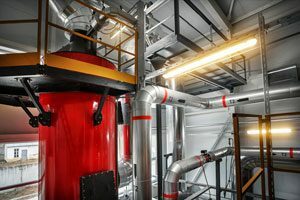 By using environmental conditions in conjunction with an economizer to reduce the building load, cool outside air is used to cool the indoor space of a building. Dampers, humidity sensors, and temperature sensors are used to verify optimal outdoor conditions for maximizing energy cost savings. Humidity sensors play a crucial role in economizer systems. These sensors should be carefully selected and installed in the process. Today we will discuss the most common type of humidity sensor used in HVAC instrumentation, the capacitance polymer humidity sensor. In a humidity sensor, a small capacitor consisting of hygroscopic dielectric material, or polymer, is placed between a pair of electrodes. When no moisture is present in the sensor, the polymer dielectric constant and the sensor geometry determine the value of the capacitance. Relative humidity is a function of water vapor pressure and ambient temperature. At typical room temperature vales, the dielectric constant in the sensor is much higher than the constant of the sensor dielectric material. This leads to absorption of moisture by the sensor and an increase in sensor capacitance. There is a direct relationship between the relative humidity, the amount of moisture in the sensor, and the sensor capacitance. Because of this relationship, the dielectric material varies at a rate that is related to the change in relative humidity. The typical uncertainty of capacitance polymer humidity sensors is ±2% RH from 5 to 95% with typical response time ranges from 30 to 60 seconds for a 63% RH step change. The widely accepted working ranges and accuracy for capacitance polymer humidity sensors has led them to be used in many commercial, industrial, and telemetry applications. Dwyer Instruments, Inc. offers a number of humidity sensing products that integrate capacitance polymer humidity sensors, such as the: Humidity/Temperature Transmitter, Series RHP; Wall Mount Humidity/Temperature Transmitter, Series RHPLC; Wall Mount Humidity/Temperature/Dew Point Transmitter, Series RHP-E/N; and Hazardous Area Humidity/Temperature Transmitter, Series HHT. For more information on any Dwyer products or humidity sensors, please reach out to our sales and technical support team. Previous PostPrevious What Are Intermediate Relays and How Are They Implemented?